They say you should marry your best friend. We can say with confidence that Wesley and Rebecca-Rose did just that! 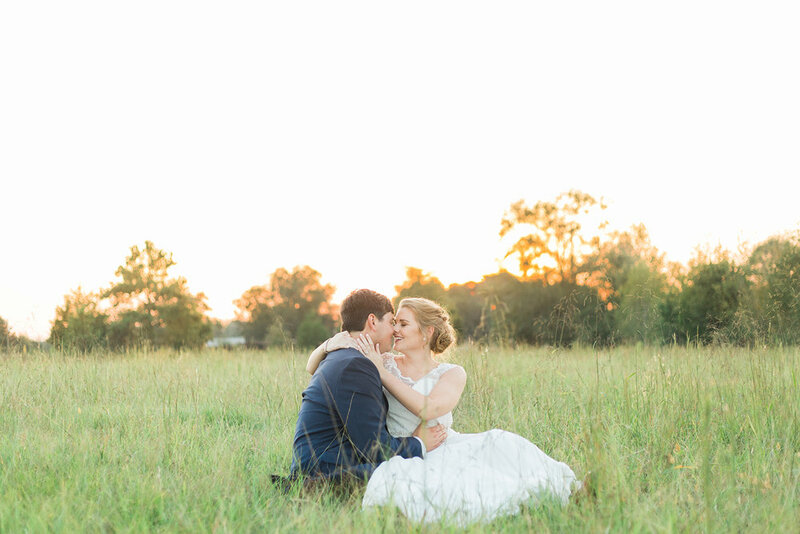 This sweet, genuine couple said their vows in October and we just had to share the details of their perfect day. 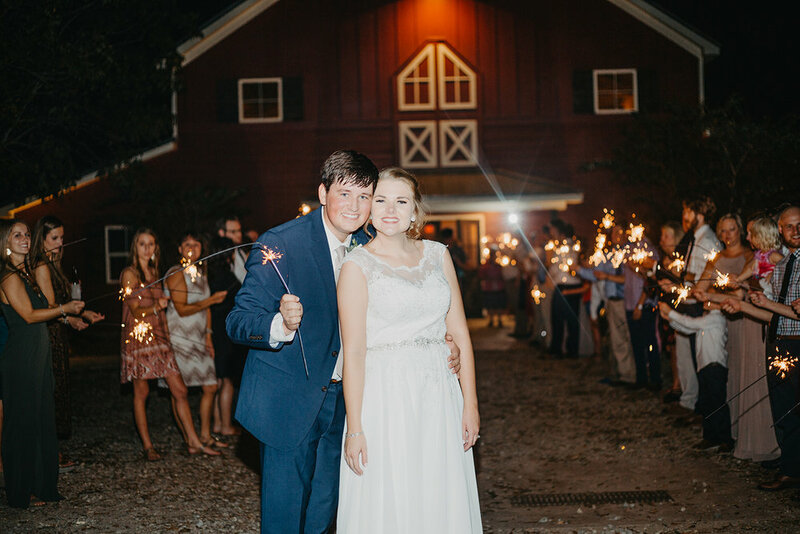 All the pictures that capture this beautiful October wedding are thanks to Taylor with Taylor Ann Photography. We are always so grateful when photographers share their work with us! To know Wesley and Rebecca-Rose is to love them. Let’s start off with the fact that they are both nurses! The world is a better place with these two kind souls taking care of people in their time of need. Both Wesley and Rebecca-Rose are friendly, patient and warm-hearted. They are generous with both hugs and laughter! They are both Georgia Southern graduates and displayed their school pride in the best places! Another thing that we noticed right away about them both is their love of family. Not only did Rebecca-Rose ask her sisters to be a part of her wedding party but her sisters and mom were also a huge part of her wedding planning. Wesley asked his Dad to be his best man and his sister was also a bridesmaid. Nieces & nephew assumed the role of flower girls & ring bearer. The ceremony was truly a family affair but have no doubt—friends were aplenty too! This group was a true reflection of the couple—kind, friendly and fun-loving. It was evident they all were happy and proud to be a part of this Fall wedding! Rebecca-Rose’s style is understated, delicate and romantic. With the help of Cyndi from Twigs, Leaves and Flowers her vision came to life through flowers and greenery. Mixing the florals with our in-house decor, the Cosnahan’s wedding day had a natural beauty that was classic & inviting to all. Candles, gold details and greenery is a timeless combination that suits all seasons. Because of their connection, it was no surprise that they opted to do a first look. First looks give you some treasured time together and give you a head start on pictures so you can get to your party faster! Before the future Mr & Mrs saw each other for the first time, Rebecca-Rose did a first look with her Dad. Back to that family connection, it’s obvious from the pictures that Rebecca-Rose, the youngest daughter of the family, has a close relationship with her Dad. The first look between Rebecca-Rose and Wesley had everyone trying to take a peek. There were lots of happy tears and laughter. First looks never cease to amaze us—they are full of emotion and in no way detract from the ceremony. Still debating whether or not to do a first look? Check back next week for an entire blog post on that subject! 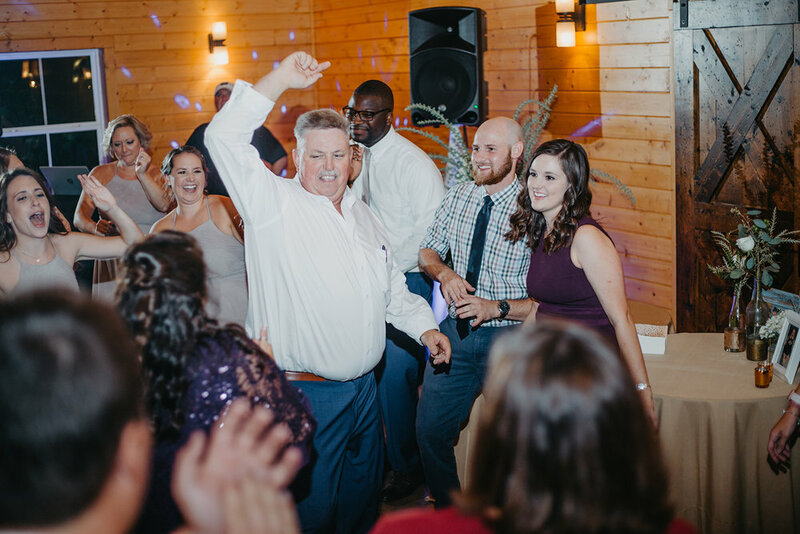 With the musical help of Jamie Eubanks from Eubanks Productions, from the minute Wesley & Rebecca Rose were announced Mr & Mrs Cosnahan the night was a true celebration. They walked up the aisle as husband and wife to “You Are The Best Thing” by Ray Montague and the music and fun never stopped. We LOVE a dancing crowd and even the Mom and Dads were on the dance floor. Wesley and his mom, Dinah had a memorable and choreographed Mother-Son Dance. Those are priceless memories that they will always have. All the details add up to the perfect day! From the creative gift baskets for their wedding party to personalized kookies for their guests, Rebecca-Rose & Wesley thought of every detail to make their day memorable for themselves and their guests. We have no doubt that everyone left feeling love, connected and a treasured part of this October wedding day. We truly wish Rebecca-Rose and Wesley a lifetime of love, laughter and happy memories. Their fall wedding day will be one we treasure for years to come! Are you planning a fall wedding? Tell us below, is your style more classic like Rebecca-Rose & Wesley or more seasonal-specific, like pumpkins and fall colors? Need more Fall tips and inspiration? Check out our other blog post!